In stock -This product will ship today if ordered within the next 34 minutes. 99.7% premium spirulina powder, silica (thickener), vegetable magnesium stearate (anti-caking agent). Spirulina can be taken all at once or with each meal. Adult: Starting-up: 2-4 tablets per day, with food, for one week. Optimum supplementation: Up to 18 tablets daily, 1 hour before meals. Below are reviews of Lifestream Bioactive Spirulina - 500 x 500mg Tablets by bodykind customers. If you have tried this product we'd love to hear what you think so please leave a review. 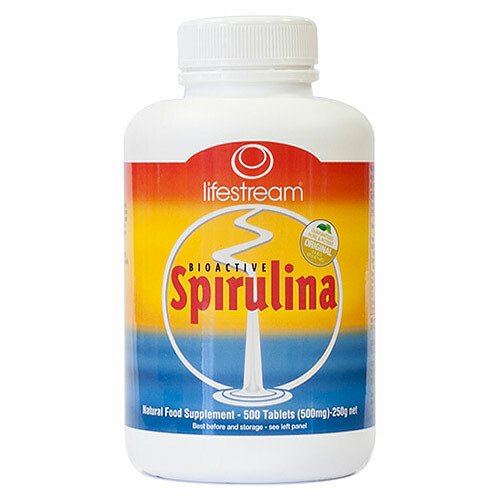 Question about Lifestream Bioactive Spirulina - 500 x 500mg Tablets What is the difference between Spirulina and Blue Green Algae? 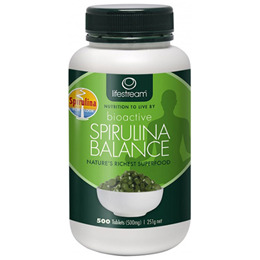 Question about Lifestream Bioactive Spirulina - 100 x 500mg Tablets What is the difference between Spirulina and Blue Green Algae?